The El Toro is made for those who are really hard on their bull horn bars. It's the only steel pursuit / bullhorn bar we know of. If you are on your third set of Nitto RB-021's, maybe it's time to try one of these. Bicycle shops can start ordering these next week. Sizes: 38, 40, 42 with a 26.0mm bulge. Note : our Urban Pursuit Levers will not fit this bar unless you upgrade to a 20.6mm+ plug. The steel tubing is thinner than aluminum thus the inside diameter is larger on the steel bar. Shops can begin ordering these next week. 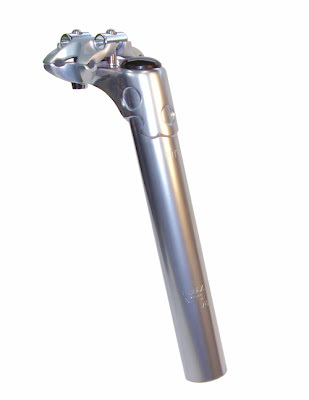 Speaking of Nitto, we just got this picture from our friends in Japan of the new lugged S84 seat post. We don't know when these will come stateside, but we will keep our eyes open. An obvious perfect match to the Rivendell lugged stems. Hopefully not as extravagantly priced as those. Our Japananese distributor was so intrigued by it at Interbike, they wanted to borrow it for their show in Japan. Then Cycle Sports saw it at their show...Long story short, we only got it back a few weeks ago. Though the test editors agreed on most of the advantages the 650b MTB platform hopes to offer, the feature they most appreciated was that the bar height was back at a reasonable level. They really don't like the jacked-up bars most 29er's have. We are now riding the prototype here in the States and hope to move to production soon. Geometry is mostly dialed in, but we are not sure should we go with nice Tange heat treated CrMo tubeset like our other frames or go with something more affordable to entice those that are not sold and just wanna try this thing out...like a plain ol double butted CrMo or a Reynolds 631? What yall think? If you have access to Japanese magazines where you are the review is featured in 2008 Issue 2. The North American Hand-Made Bike Show in Portland attracted almost 3x the attendees as last year. Exciting show, yes. But perhaps just as exciting was the Rapha Roller Race party. Where else could you see frame builders racing against eachother. It's called roller racing across the pond, but it is probably better known as "goldsprints" here stateside. Rapha hired the newly-formed West Coast Gold Sprints outfit to supply the equipment. 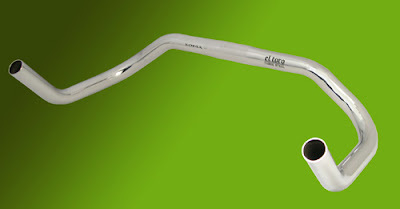 Soma proudly sponsored four Rush frames and a variety of parts for the bikes. Pictures capturing all the action can be seen on BikeDaily.net's Flickr page. Thanks to Teisuke for letting us re-post a couple here. West Coast Gold Sprints is currently booking gigs not just in the SF Bay Area, but up and down the coast. Look for them (possibly) at Sea Otter this year. To find out what their next venue is, get on their mailing list. Here's an example of how off the back we can be at promoting ourselves. Patrick O' Grady of Mad Dog Media (and VeloNews fame) bought a Double Cross for his wife back in Dec. 06. We were aware of that purchase, but never knew that he bought one for himself as well last June. So here we are name-dropping 8 month later. If you are interested in what he thinks of them, see the 9-09-07 and 6-15-07 entries on The Daily Dog. In other Double Cross news, you people have been asking about the Double Cross Disc/Canti edition. We have delayed releasing this at least until May. We apologize to those who were looking to get this for their spring rides. We just have a lot of things taking up our time and y'know... trying to catch up on promoting ourselves 'n s__t. We have more bars coming out..... the El Toro STEEL pursuit bar is coming out end of the month. This will be the only steel bullhorn bar on the market we think. We have had multiple e-mails of people destroying their alloy bullhorns on a regular basis. We made these for them. First batch will be 26.0's like Nitto's are. If you prefer 25.4, give us a holler. We are also wrapping up development on straight bars in colors (how hard can that be?). Plus we are testing the B-Side 650b MTB frame and finishing specs on a new mixte frame. Yes, mixte! 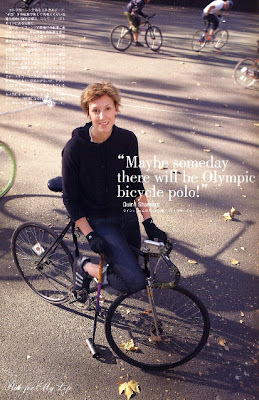 "Maybe there will be Olympic bicycle polo!" This thought was expressed by Quinn Shamlian, a professional photographer seen below. One of our Japanese agents is a fixie fan and found this image in a Japanese cycling magazine with Quinn playing polo on a Soma Rush.